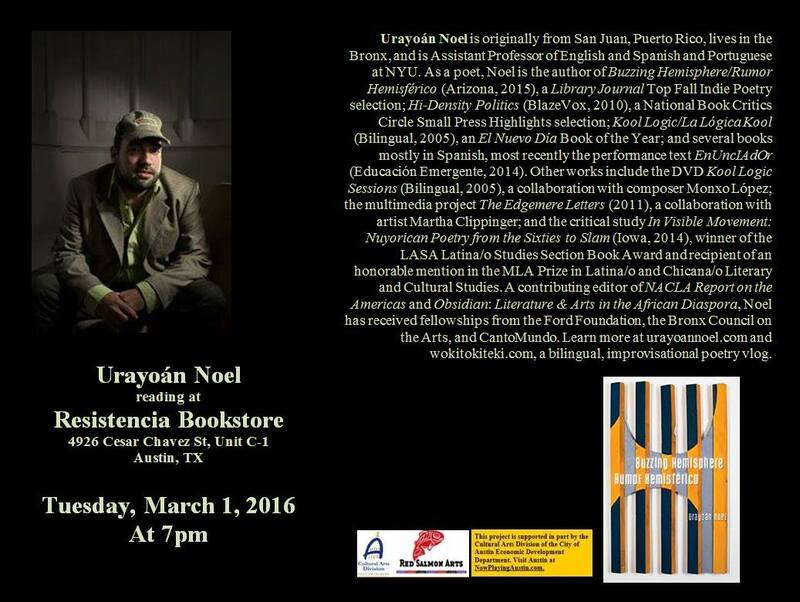 Urayoán Noel is originally from San Juan, Puerto Rico, lives in the Bronx, and is Assistant Professor of English and Spanish and Portuguese at NYU. As a poet, Noel is the author of Buzzing Hemisphere/Rumor Hemisférico (Arizona, 2015), a Library Journal Top Fall Indie Poetry selection; Hi-Density Politics (BlazeVox, 2010), a National Book Critics Circle Small Press Highlights selection; Kool Logic/La Lógica Kool (Bilingual, 2005), and El Nuevo Día, Book of the Year; and several books mostly in Spanish, most recently the performance text, EnUncIAdOr (Educación Emergente, 2014). Other works include the DVD Kool Logic Sessions (Bilingual, 2005), a collaboration with composer Monxo López; the multimedia project The Edgemere Letters (2011), a collaboration with artist Martha Clippinger; and the critical study In Visible Movement: Nuyorican Poetry from the Sixties to Slam (Iowa, 2014), winner of the LASA Latina/o Studies Section Book Award and recipient of an honorable mention in the MLA Prize in Latina/o and Chicana/o Literary and Cultural Studies. A contributing editor of NACLA Report on the Americas and Obsidian: Literature & Arts in the African Diaspora, Noel has received fellowships from the Ford Foundation, the Bronx Council on the Arts, and CantoMundo. Learn more at urayoannoel.com and wokitokiteki.com, a bilingual, improvisational poetry vlog.